This year, the Fourth of July celebration falls midweek, giving many people an extended holiday. The goal over the next few days for the Maryland Department of Natural Resources is simple: fewer boating accidents. 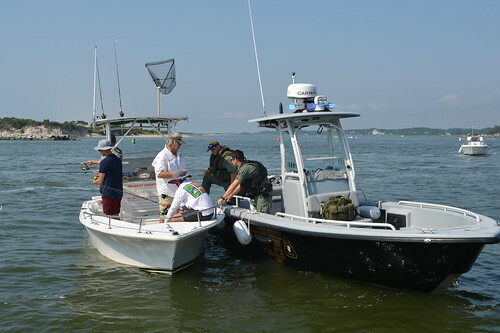 The game plan is direct: the Natural Resources Police will be going all-out on the state’s waterways, from Deep Creek Lake to the Atlantic Ocean, to ensure an enjoyable and safe boating experience. Historically, July and August account for about half of Maryland’s annual total of boating accidents. So far this year, Maryland has recorded 11 boating fatalities, two more than for all of 2017. Only one of the 11 victims was wearing a life jacket. This holiday period began last weekend with Operation Dry Water, a nationwide campaign to curb alcohol- and drug-impaired boating. Nine boaters were arrested for operating under the influence, down two from last year. The highest blood alcohol level among those was 0.22, nearly three times the legal limit. Officers issued 181 tickets for other violations, 494 written safety warnings and conducted 1,905 vessel safety checks. Wear a life jacket. The vast majority of victims over the last five years were close to shore. A life jacket would have bought needed time until help arrived. Make sure everyone on board is wearing an appropriate life jacket that fits properly, or an inflatable life vest. Designate a sober skipper. A captain is responsible for returning the boat and its passengers safely to shore. Don’t overcrowd. Heed the boat’s capacity plate on the transom or helm, or look up the passenger capacity in the boat’s manual. Chart a safe course. The Fourth of July is sometimes the first and only time people venture out after dark. Visual navigation markers boaters rely may be invisible at night. Chart a route in advance and use GPS to help find your way. Remember navigating at night can be just as dangerous as boating in inclement weather. Follow directions. The Maryland Natural Resources Police, U.S. Coast Guard, U.S. Coast Guard Auxiliary and local police can help direct you to where you may safely anchor to view fireworks, away from sparks and ash. Don’t be in a rush. Let some of the boat traffic clear out before you raise anchor after a fireworks display.